The outcome of this afternoon’s game took a momentary backseat in the third inning when Indians starter David Huff was struck just over the left ear by an Alex Rodriguez line drive. The impact off Huff’s head was so severe that the ball wound up landing in shallow right field for an RBI double. Immediately upon being struck, Huff dropped to the ground and lay prone while several Yankees rounded the bases. The game action seemed academic, however, and once time was called players from both teams congregated around the trainers, who attended to the young Indians’ lefty. Eventually, Huff was taken off the field on a motorized stretcher, but was able to give a thumbs up to the cheering crowd. David Huff lies motionless on the mound after being struck in the head by a line drive off the bat of Alex Rodriguez (Photo: The Canadian Press). The Yankees tacked on another run in the third to increase their lead to 3-0, but the drama of the situation and long delay seemed to have an impact on Sabathia. After cruising through the first three frames with only 31 pitches, Sabathia would need exactly that amount to get through just the fourth inning. In the inning, Sabathia’s fast ball command abandoned him, and with it, his willingness to throw it. On successive at bats to Mark Grudzielanek Matt LaPorta, Sabathia surrendered an RBI single and two run double on a slider and change up, respectively. After giving up the lead, the Yankees quickly responded with six more runs in their half of the fourth, thanks mostly to the wildness of Aaron Laffey, who walked three straight batters and hit Mark Teixeira with a pitch to force in two runs. Cano then doubled home another pair of runs before Laffey was lifted from the game after throwing 38 pitches in the inning. Francisco Cervelli capped off the rally with a seeing eye single up the middle that knocked in two more runs. After the interminable fourth inning, the rest of the game proceeded at a pace that only Joe West could appreciate. C.C. Sabathia was never able to find his rhythm, but did get through six innings before handing off to the bullpen what seemed like a very safe 10-5 lead. The top of the seventh inning was complicated when David Robertson had to leave the game after two batters because of stiffness in his lower back. From that point forward, Joe Girardi decided to play his usual late inning game of bullpen roulette. After one batter a piece, Girardi burned through Sergio Mitre and then Damaso Marte before settling on Joba Chamberlain to record the final out in the inning. Chamberlain would go on to finish off the seventh, but not before allowing both inherited runners to score along with four additional runs of his own. By the time the smoke had cleared, the Indians scored seven runs and turned what had been a laugher into a comedy of errors for the Yankees. The Indians increased their lead to 13-10 in the eighth when Russell Branyan homered off Chad Gaudin, and then held on in the ninth as the Yankees tried one last attempt to mount a comeback off Kerry Wood. As they often do, the Yankees were able to bring the tying run to the plate, but Nick Swisher whiffed on a Wood fastball to end the game and seal the deal on a monumental collapse. Just when it seemed as if the offense was starting to turn the corner, the bullpen has now emerged as a major hole for the Yankees. Chamberlain has now played an instrumental role in blowing three games over the last two weeks, including two leads of four runs or more. What’s more, he has failed to develop into the reliable “8th inning” guy that Girardi envisioned, and the Yankees may now need to revisit the decision to entrust the late innings to their erratic, under-achieving righty. Meanwhile, the injury to Robertson only further clouds the picture as no other reliever aside from Mariano has shown signs of being able to provide consistent, quality innings out of the pen. Making matters worse is Girardi’s inability to realize that he simply can not burn through relievers. Instead of allowing one to get on a roll, Girardi keeps shuffling through the entire bullpen, ensuring that he will eventually find the bullet in the chamber. The Yankees can talk about having the second best record in baseball all they want, but their performance in May has raised several legitimate questions about their ability to hold up over the summer pennant race. If Cashman and Girardi don’t come up with answers to those questions, they’ll have an extra month in the off season to figure out what went wrong. Before the game, the Yankees honored surviving members of the Tuskegee Airmen, the first unit of African American airmen in U.S. military history. Today’s game marked the 15th anniversary of Derek Jeter’s major league debut in a games against the Mariners at the Kingdome. Arod’s first inning sacrifice fly snapped a seven game stretch without an RBI. When Mark Teixeira was hit by a pitch with the bases loaded in the fourth inning, it snapped a 10 game streak without an RBI. During that time, Teixeira stranded 20 runners in scoring position. Sabathia succeeded in not giving up a home run for the first time in seven starts, the longest such stretch in his career. With three more RBIs in today’s game, Robinson Cano has knocked in nine runs over the last three games. Cano also knocked in at least three runs in two consecutive games for the fifth time in his career, and at least two runs in three consecutive games for the fourth time. 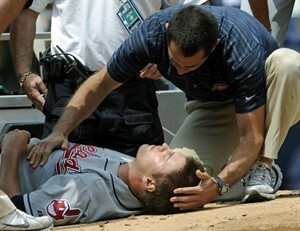 During the game, the Indians announced that a CT scan of David Huff’s head was negative. Hey your blog looks really good. I’m new to this so I’m just checkout out other blogs to get an idea how to do this. If you can give me any tips it’d be much appreciated.